Quando a minha amiga Sofia viu o saco de bebé que fiz para o Tiago, avisou-me que se precisasse um dia iria pedir-me um igual. Entretanto, assim que me disse que estava grávida, há já uns meses, relembrou-me do seu pedido e eu, claro está, aceitei com todo o gosto. Assim que soube que seria uma menina, a Ema, escolheu este tecido lindíssimo, e outro de bolinhas para coordenar. 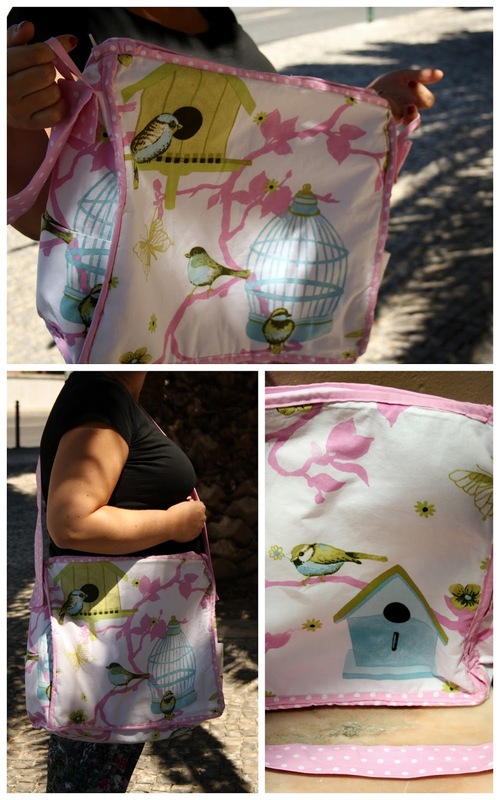 When my friend Sofia saw the baby bag I made for my son Tiago, she warned she might ask me to make one for her in the future. Meanwhile, she got pregnant and reminded me of her request. It is always such a great pleasure to make things for friends! As soon as she found out that she was expecting a girl, she chose this amazing fabric, with a coordinating polka dot one for the inside and the details. Avisei-a que iria ficar imperfeito: fazer um saco destes é das coisas mais difíceis em costura e eu não tenho a prática, a técnica ou o jeito necessários para uma senda destas. Para além disso, guardei os padrões que desenhei na altura, mas não as instruções, por isso fui por memória e tentativa e erro. Mesmo assim, este ficou mais perfeito do que o do Tiago. Tomei muitas decisões que me facilitaram a vida, outras que ma dificultaram. Decidi também debruar a totalidade do saco, o que me deu uma trabalheira fenomenal, mas que valeu bem a pena. E fazer duas pequenas alças para pendurar no carrinho, uma melhoria importante em relação ao saco anterior. I've warned her it wouldn't be perfect: this kind of bag is one of the most dificult things to sew and I don't have neither the practice, the tecnique nor even the skills to make something like this with store-bought perfection. Adding to that, I kept the patterns I'd designed before, but had never written the step-by-step instructions, so I made it by heart and by trial and error. Despite all, it ended up much more perfect than the previous one. I've made some decisions that were time and life savers, others that turned my work into a nightmare. I've also decided to bind it completely, which took me about one third of the time used for sewing the complete bag. However, the final result was well worthy of the additional effort. I've also made two small handles, to make it easier to attach it to the stroller, something that I miss in my own bag. Em suma, não me volto a meter numa destas sem dominar melhor algumas técnicas fundamentais, por isso os próximos projectos de costura terão que ser bem mais simples. No entanto, no fim de contas e apesar dos percalços, acho que ficou bem. A Sofia gostou e não se importou com as imperfeições e isso é o mais importante. Agora só falta nascer a pequena Ema para lhe dar uso. Long story short, I will not make another complex bag without fully dominating some of the techniques I used here. However, and despite all the imperfections, I think that my friend was happy with the final result and that is what really matters. Now, we just have to wait for little Ema to make use of it. Só tu para não veres os defeitos! Beijo!